from the incline to horizontal plane. 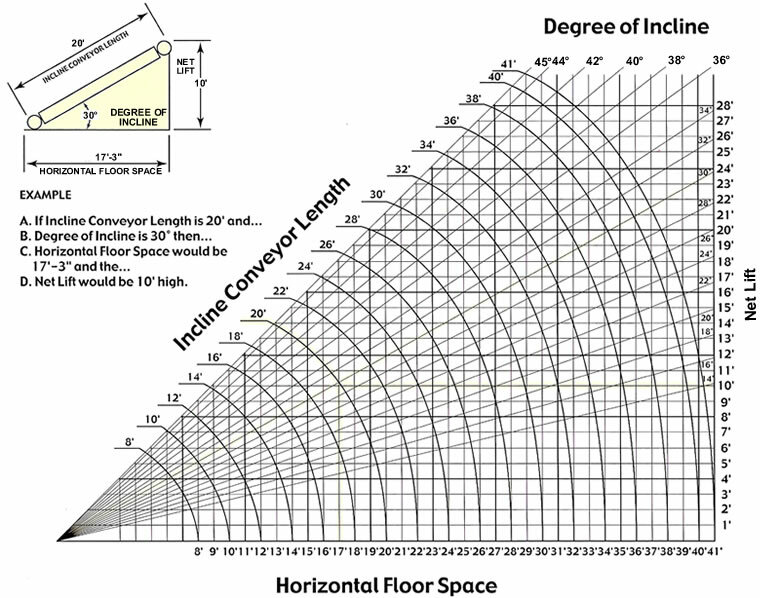 Inclines are easily adjusted up to 30°. in. x 12 ga. powder painted, formed steel channel frame. TAKE-UP - Take-ups in center drive provides 16 in. lubricated ball bearings. Snub guards included. up to 30° incline adjustment. ball bearings on drive, tail and take-up pulley. speed reducer. No. 50 roller chain to drive pulley. MOTOR - 1 HP-208/230/460/575V-3 Ph. 60 Hz. Totally Enclosed C-Face "SSB" brake motor (6 ft./lb.). CENTER DRIVE - Located on the incline section. Chain guard located on left hand side. DRIVE PULLEY - 8 in. dia. with 1-7/16 in. dia. shaft at bearings, machine crowned and fully lagged. 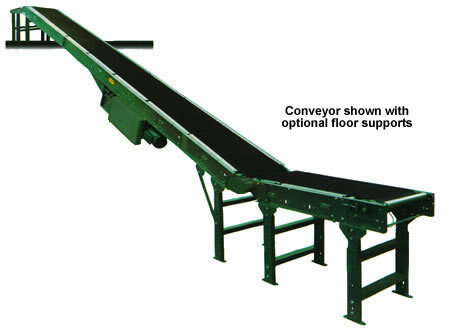 conveyor 100 lbs. NOT TO EXCEED capacity in chart. TAKE-UP PULLEY - 6 in. dia. with 1 3/16 in. dia. shaft at bearings, machine crowned. 13" 10" 16" 35 1/2"
17" 14" 20" 50 1/2"
27" 24" 30" 67 1/2"
31" 28" 34" 79 1/2"
37" 34" 40" 91 1/2"
PULLEYS - 6 in. dia. tail pulley with 1-3/16 in. dia. and reducer. Allow 65 in. 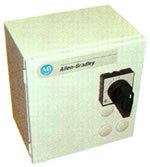 reversible magnetic starters and push button stations. Motor 208/230/460/575 Volt 3 Ph.-60 Hz. 10" 12" 14" 16" 18" 20" 22" 24" 28" 30" 34" 36"
16" 18" 20" 22" 24" 26" 28" 30" 34" 36" 40" 42"
Other lengths not listed in price chart are available. For "IN-BETWEEN SIZES", use next larger Overall Length "A" price. For lengths longer or shorter than those shown in chart, please contact us. For "IN-BETWEEN WIDTHS", use next width plus 10%. For widths over 42" OAW, contact us. Use per foot price of width x required length, supports not included. section and one (1) support required per bed section thereafter. regularly finished). See chart Below. 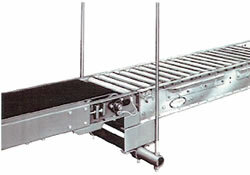 16" to 28" 30" to 42"
Prices Per Foot of Conveyor Length "A"
* Reducer size increases with 2 HP. guard and sprockets when C-Face drive is supplied. $20.17 NOTE: Specify quantity each. over 40 bed length, floor supports required. Extra Motor Price for OTHER THAN: 1 HP208/230/460/575 V3 Ph.60 Hz.Totally Enclosed. Speed affects horsepower requirements. Note: MS-3 to MS-12: Knee Braces included in price. 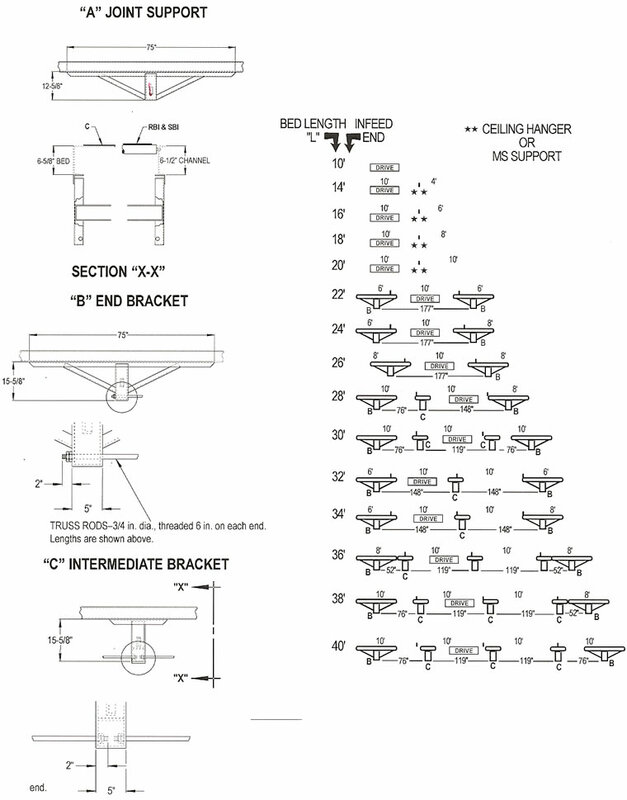 Ceiling Hanger Brackets with (2) 5/8 dia. maximum speed of 250 FPM. NOTE: Overall length of 35-1/2 requires one support. 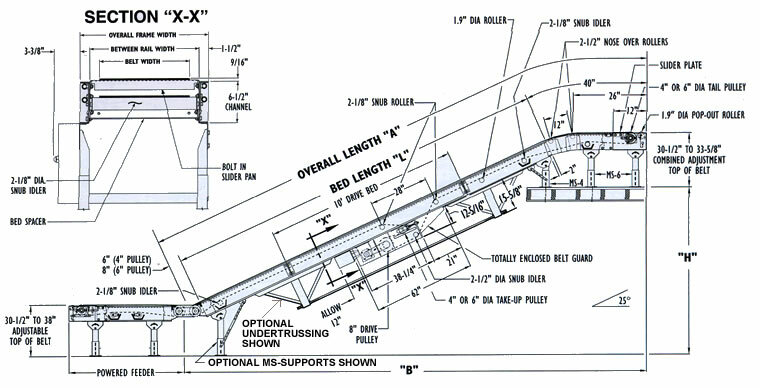 Overall length of 50-1/2 or more requires two supports. Supports not included in base price. Min. Length Overall 35-1/2" 35-1/2" 50-1/2" 50-1/2" 50-1/2" 50-1/2" 50-1/2" 67-1/2" 79-1/2" 79-1/12" 91-1/2" 91-1/2"
*Will be supplied with rounded end in lieu of feeder. Pulley 27" 31" 33" 37" 39"
Width 10" 12" 14" 16" 18" 20" 22" 24" 28" 30" 34" 36"
Width 16" 18" 20" 22" 24" 26" 28" 30" 34" 36" 40" 42"
All weights are conveyor weights only. Accessories, crating, etc., are not included.